Marduk is a black metal band from Norrköping, Sweden. The band formed in 1990 and released their first album in 1992. Their name is derived from the Babylonian god Marduk, patron deity of Babylon. Marduk was formed by Morgan Steinmeyer Håkansson in order to form the "most blasphemous band in the world". 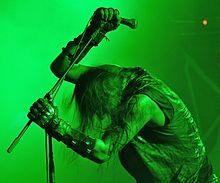 Their musical style was that of a straightforward death metal influenced take on black metal music, but as the years progressed their style and imagery became more of a fast and intense form of black metal. Marduk's predominant lyrical topics are Satanism, anti-Christianity, Biblical tales, death, Third Reich history, and World War II. The latter two are a later addition to their lyrical/conceptual themes, stemming from their 1999 release Panzer Division Marduk. Marduk have recorded further songs relating to those chapters of human history, such as "The Hangman of Prague" (moniker of Reinhard Heydrich - second in command of the SS - in his capacity as the de facto Reichsprotektor of Bohemia and Moravia), "Night of the Long Knives", "Deathmarch" and others. In a 1995 fanzine interview, the guitarist named Håkansson spoke out against immigration to Sweden in the name of the band and said he was proud that his grandfather had served as a German officer during the Second World War. In September 2016, The band was supposed to tour the U.S with Carach Angren, Rotting Christ, and Necronomicon but was forced to drop out, leaving the other three to continue on due to some visa situations. Due to that, the band was forced to postpone the tour. The band will make up the dates with a North American tour in early 2017. In late February their planned Oakland show was cancelled by the venue for fears of security issues after a local Antifa group targeted the band and reportedly threatened the venue staff. ^ "Marduk. In: Nordic Vision. Nr. 3, 1995" (PDF). ^ "Marduk's Oakland show cancelled due to security concerns". teamrock.com. 2017-02-20. Retrieved 2017-02-21. Loudwire report that the band were last week targeted by the Anti-Fascist Action Bay Area, who, in a Facebook post that has now been taken down, called them a “black metal band with known white supremacist ties from Sweden that profits off of glorifying Nazi imagery and songs about Nazi SS officers and anti-semitism.” But after researching Marduk, the venue found no indications that they were “white supremacists, nationalists, or anti-immigrant” and wanted the gig to go ahead. However, after staff were reportedly threatened, and in consultation with police, it was decided the show would be scrapped.